New Winter 2018: Hours of fun and a lifetime of memories are created when the generations get together. Great grandma passes along traditional recipes, and the kids enjoy new treats! Those special moments are captured in colorful form in the baking cookies with great grandma 3 children personalized Christmas ornament that arrives to everyone's delight in our classic velvet storage bag. This is a grandparents ornament personalized for the recipients of both generations, so we'll paint on by hand in an artistic font the details you provide. 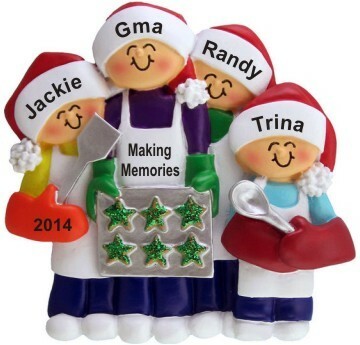 Keep the memories as fresh as the Christmas cookies in years to come with the great grandma 3 kids baking cookies ornament personalized for lasting value.